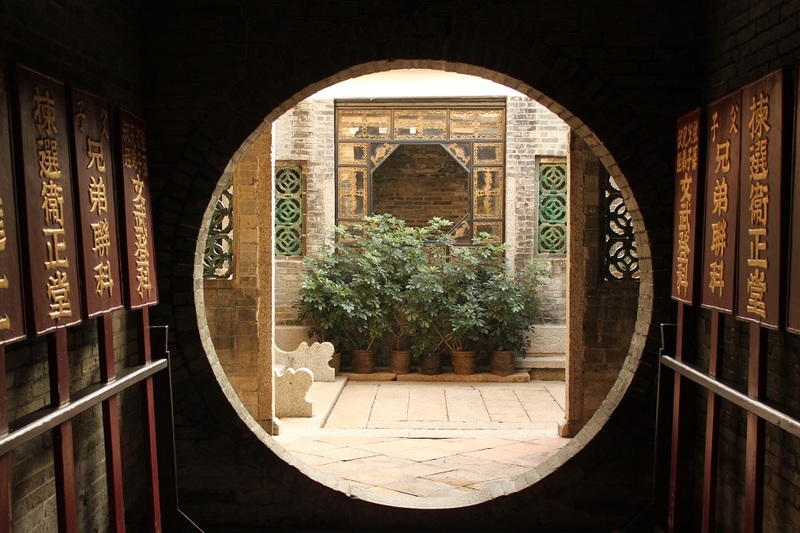 Treasures of A Heritage Trail | What an Amazing World! The MTR train moved at a steady pace leaving the ever-bustling Tsim Sha Tsui district in Kowloon. On the ground above the train station dozens of skyscrapers scrambled for space in this constantly developing part of Hong Kong, just across the harbor where one of the world’s financial centers pulsated relentlessly. We were moving away from hordes of tourists and shoppers, coming to Kowloon in steady influx, as well as from local businesses which helped make Hong Kong a thriving place for fortune-making. From the window of the train the view of dense tall buildings were soon replaced by rows of residential houses as we moved further away from the city. Moments later from the northwest corner of the territory where we were heading, tall skyscrapers loomed from the horizon. One might have the thought that the train was returning back to downtown Hong Kong. But it was not. “That’s Shenzhen,” James told me. The Chinese border city has been benefiting from its proximity with the former British colony, ensuring a steady economic growth in the once small village. 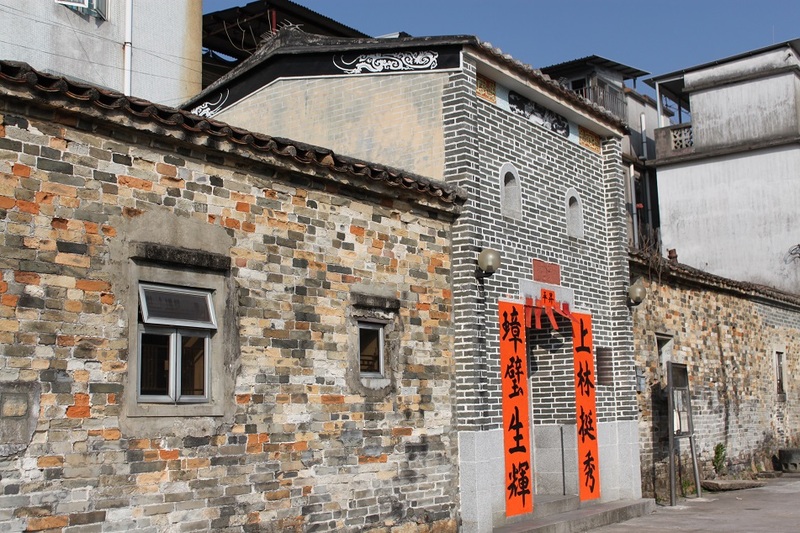 Besieged by rapid developments from both the north and the south, Tin Shui Wai in Hong Kong’s New Territories is a rare case where heritage is celebrated and preserved, instead of being razed down to the ground to make way for ‘modernity’ as is the norm in Hong Kong. 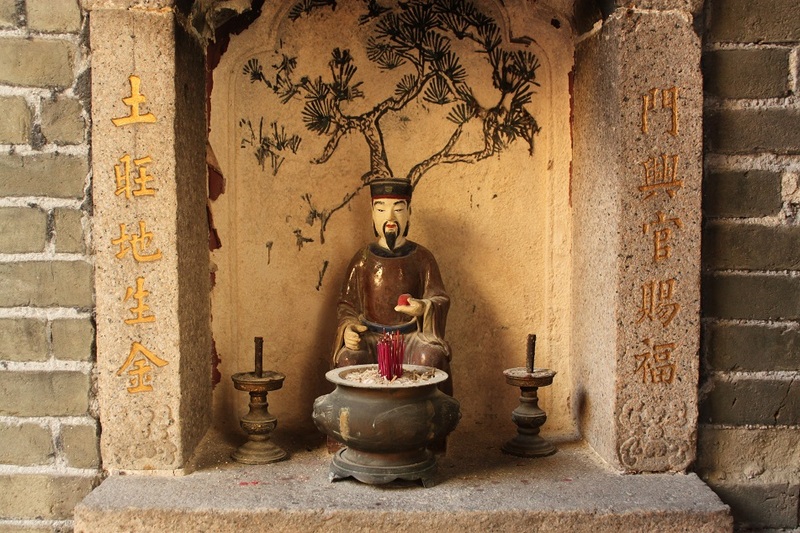 After a 40-minute journey James and I alighted at Tim Shui Wai’s modern train station, crossed a small street, then arrived at one of Hong Kong’s historical and less-celebrated treasures: Ping Shan Heritage Trail. 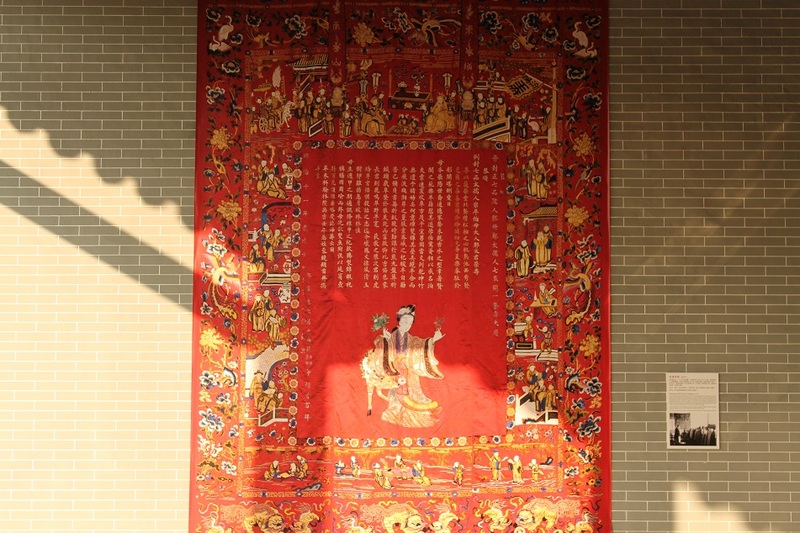 Nine centuries ago five family clans settled and flourished in what is now the New Territories, with The Tang later emerged as the most dominant among the five. 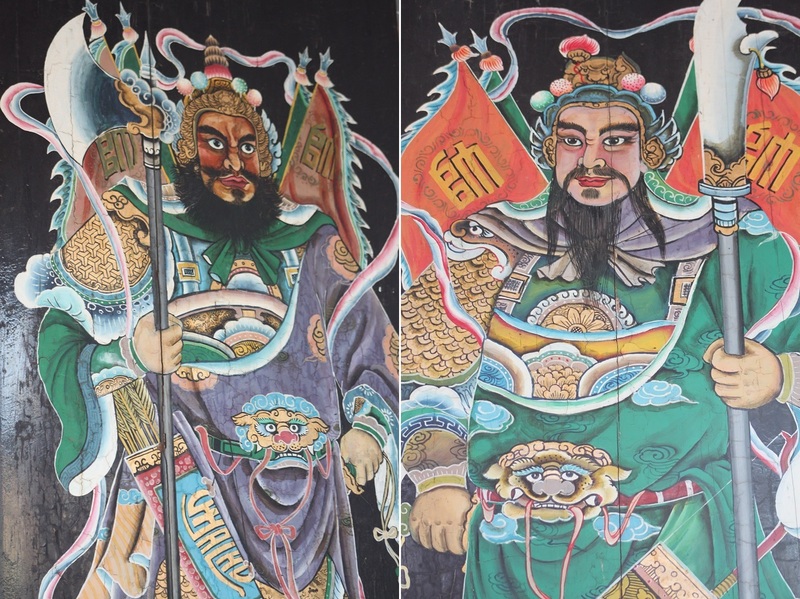 Claiming royal lineage to the Southern Song Dynasty, The Tangs produced scholars and officials for the empire long before the British took possession of the territory. 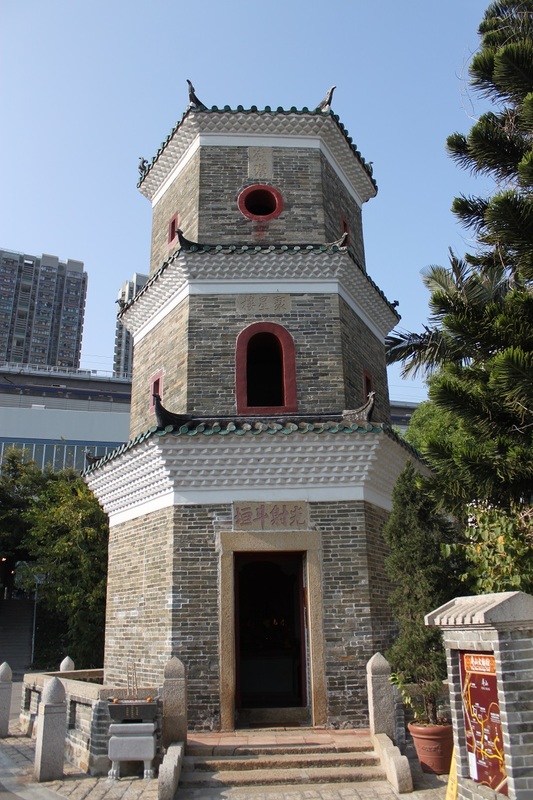 Marking the start of the trail was Tsui Tsing Lau Pagoda, the oldest of such structure in Hong Kong. The 14th century pagoda was said to have seven stories until a fierce storm reduced it to only three. 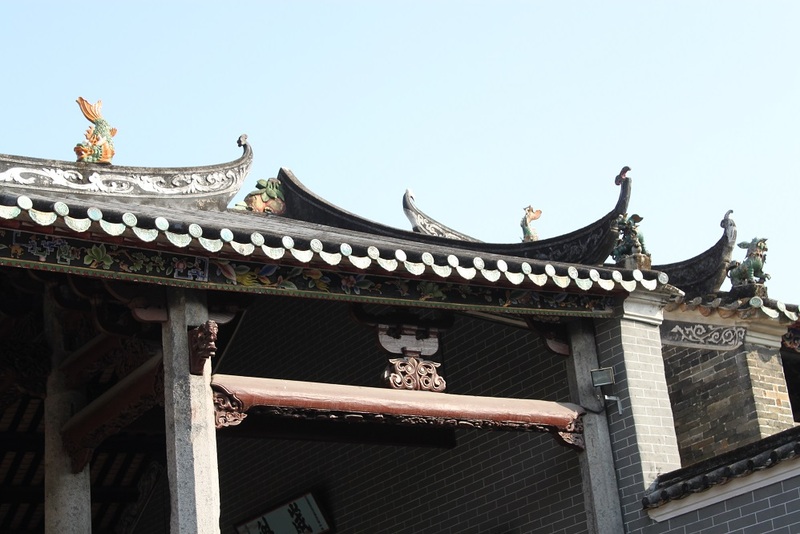 Walking past the hexagonal-shaped pagoda, we reached the remaining protective walls of Sheung Cheung Wai, a 200-year-old village also built by The Tangs. The narrow gate provided us a glimpse of the houses inside the sole walled village along the heritage trail, so quiet and peaceful that afternoon. Walking down snaking path amid small houses brought us to the Tang Ancestral Hall, arguably the most opulent structure on the heritage trail. 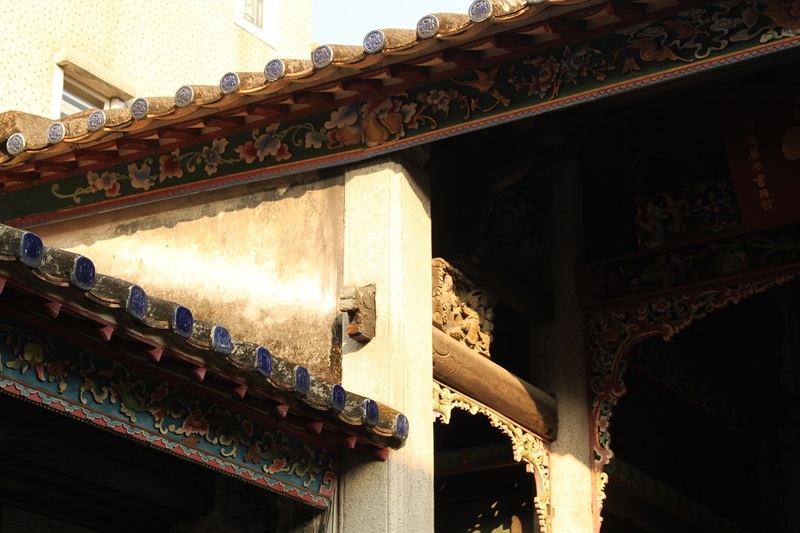 Upon entering the gate to the courtyard, an ornately decorated roof studded with statues of mystical beasts came into sight, supported by even elaborately-carved rafters. 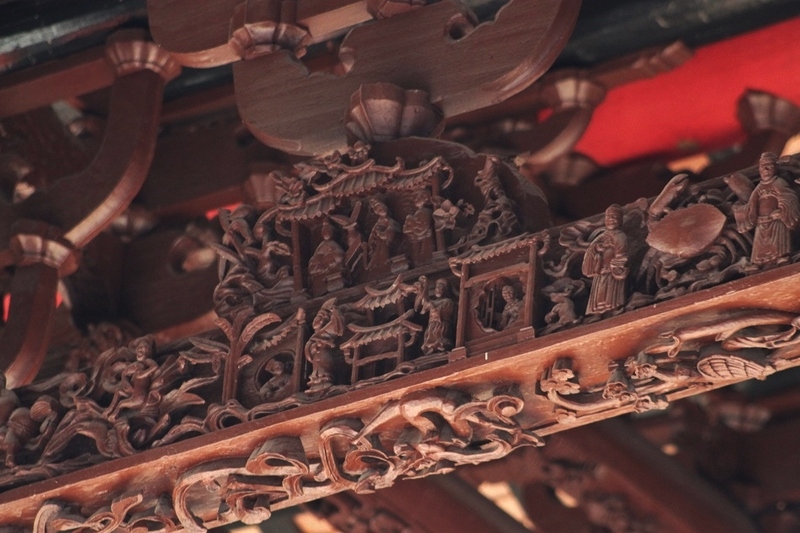 Each wooden beam was scrupulously sculpted with figurines and floral motifs, exuberant and fitting for the house of a royal descent. 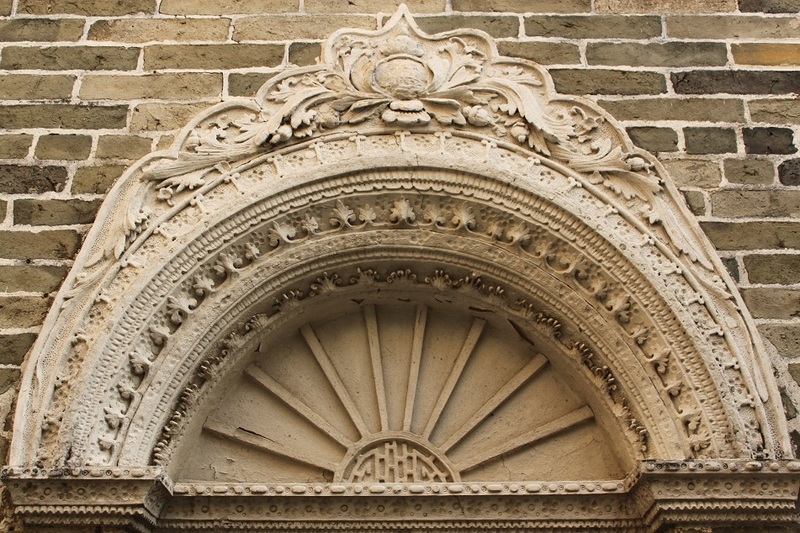 It was built to impress, and it still does centuries after its completion. 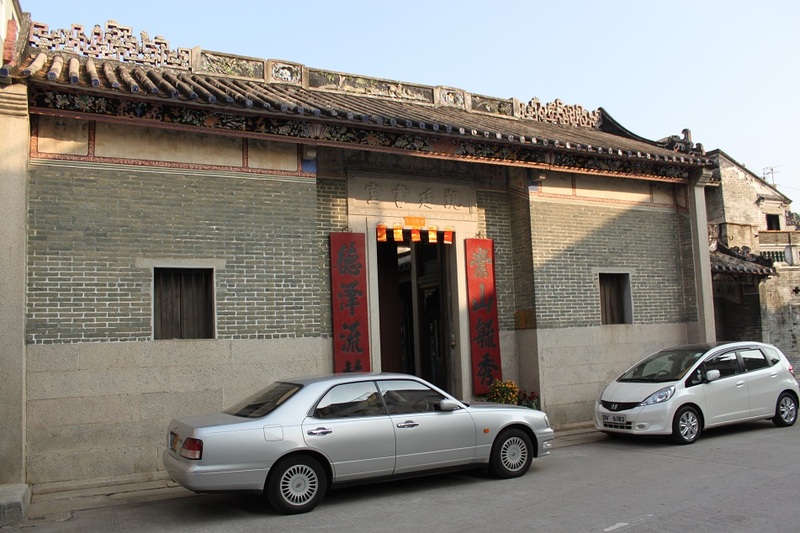 Next to the impressive compound lied another, and newer, ancestral hall: the Yu Kiu Ancestral Hall, built three centuries after its neighbor. 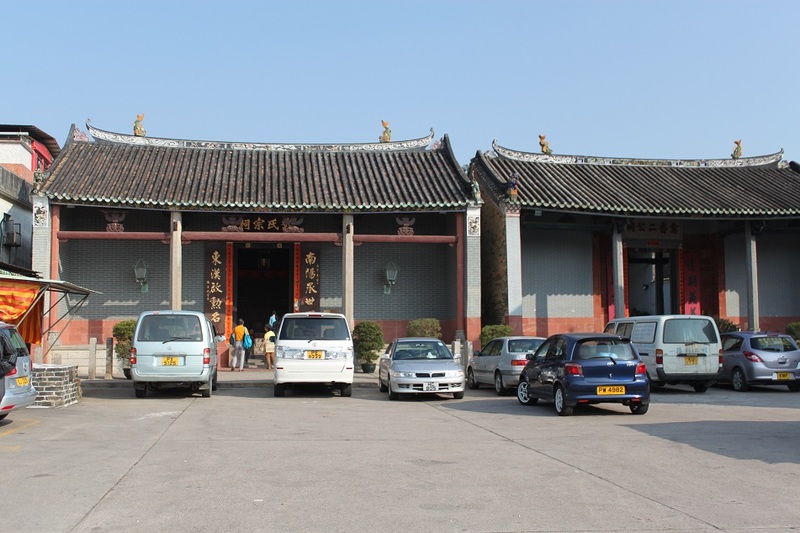 But the true jewels of Ping Shan rested within a short walking distance from the two ancestral halls. 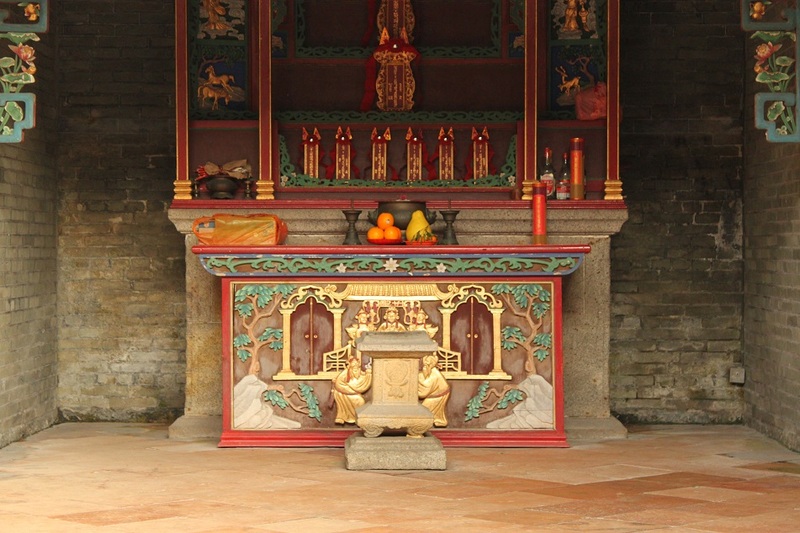 Kun Ting Study Hall was erected only a few decades before the Chinese government ceded the New Territories to the British. 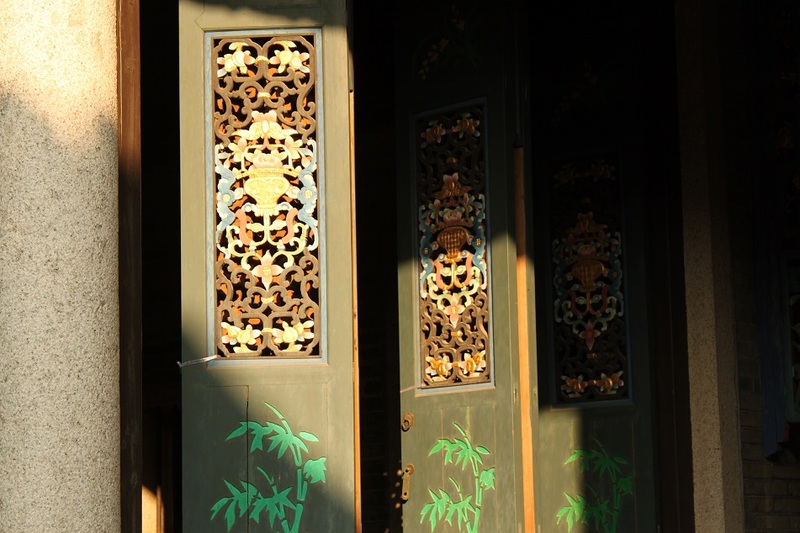 Embellished with beautiful carvings on wood and stone, as well as colorful folding doors and glazed green ceramics, the study hall was constructed for those who were preparing for the imperial civil service examination. 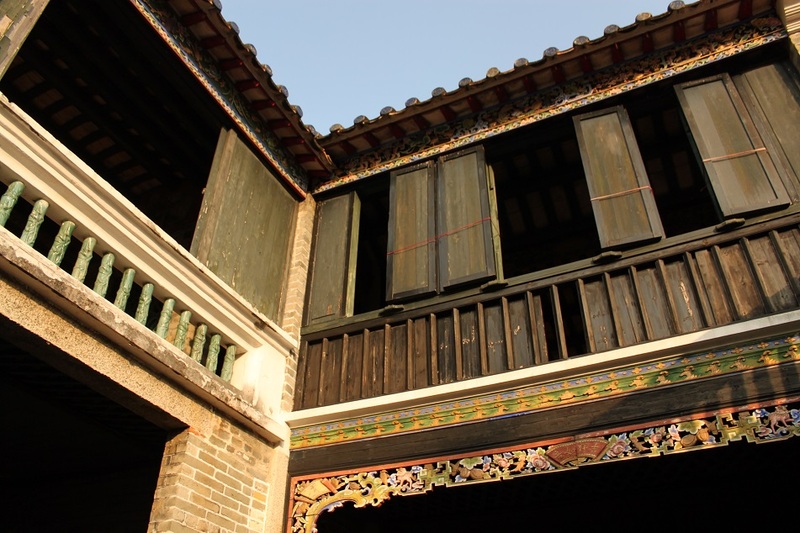 The neighboring Ching Shu Hin was built four years later as a guesthouse for visiting scholars and dignitaries. 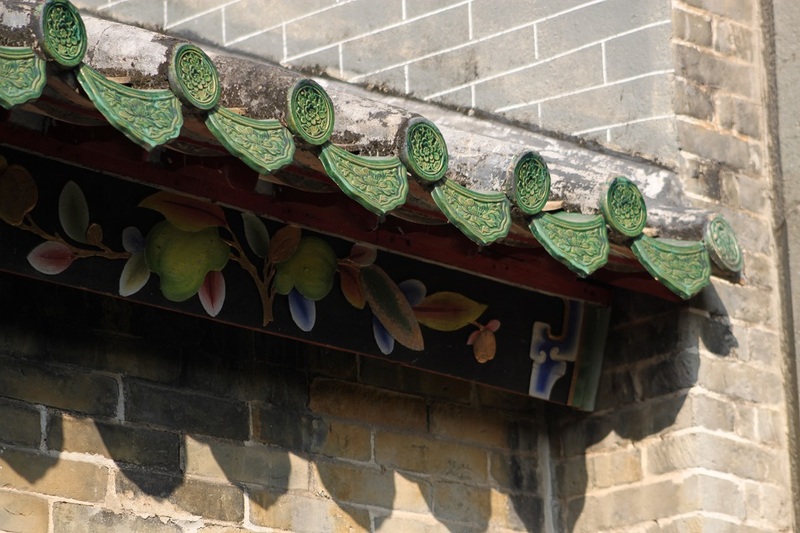 It was one of the clan’s latest additions to Ping Shan before the land changed possession to a new European ruler whose colony in southern China was once limited only to a small hilly island and a narrow peninsula just across the harbor. 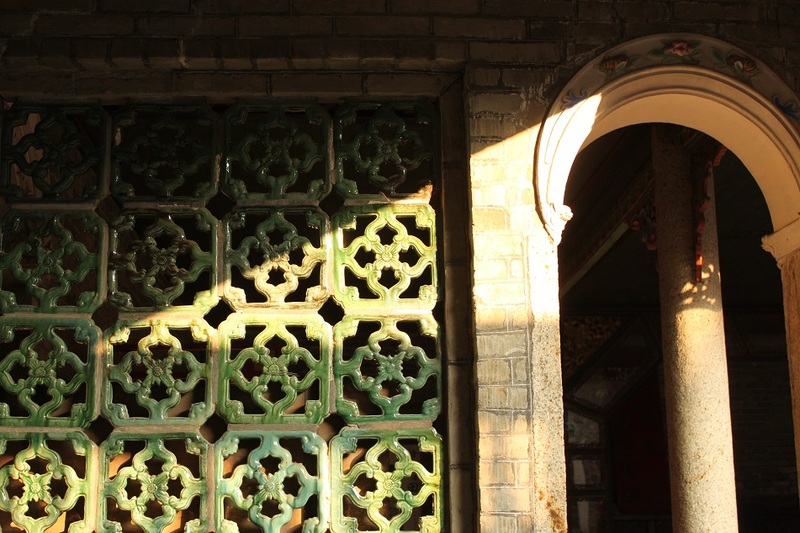 The sun was starting to set in the west, only a handful of local Hong Kongers were still strolling the quiet alleys along Ping Shan Heritage Trail, a tranquil corner of the territory so rich in history yet many seemed unaware of. Thank you! 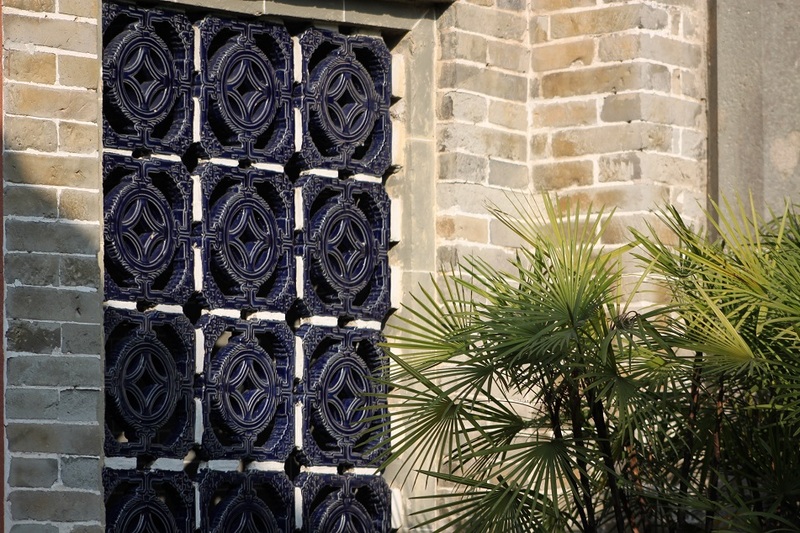 Ping Shan is one of Hong Kong’s less known treasures waiting to be explored by those who love history and architecture. Such an informative post. I’d never heard about this place during my year in Hong Kong. It seems like one of those places in HK where you can just get away from it all. Usually for me that was a visit to Chi Lin nunnery and gardens, or to one of the islands for a scenic walk. It’s understandable that this place is off most people’s radar, even the locals. My best friend has been living in HK for more than 10 years, but early this year was his first time visiting Ping Shan. It’s so far away from the city that you would feel like you’re not in HK, as is the case with many of the territory’s small islands and hiking paths in Sai Kung. I always enjoy the way you express your experiences in this blog. I learn a lot from this blog how to write and deliver well to the audiences. Thanks Mas Bama. Hi Fadhil. Nice to have you here and thank you for your kind words. I’m really glad this blog does that to you because I myself was inspired by other blogs during my early years writing on this blog. It’s one of the best things about blogging, we inspire each other. Thank you, Halim! Salah satu hal yang paling bisa bikin saya betah berlama-lama di suatu tempat adalah ukiran-ukiran yang detil dan rumit. Saya bisa ambil ratusan bahkan ribuan foto dari satu tempat saja. 🙂 Halim, kayaknya di Solo saya bakal butuh bantuanmu untuk datengin tempat-tempat menarik yang banyak orang belum tahu. Tapi mungkin saya belum akan ke Solo tahun ini, kemungkinan besar tahun depan. Menariknya di tengah Hong Kong yang modern banget, masih ada yang mempertahankan bangunan tersebut. Sungguh suatu contoh yang baik. Hong Kong mungkin mencontoh Singapura karena negara tetangga kita itu untuk urusan menjaga bangunan tua dari masa kolonial lebih maju dari HK. Jakarta dan kota-kota lain di Indonesia seharusnya bisa belajar bahwa dengan mempertahankan gedung-gedung lama sebetulnya bisa menguntungkan secara bisnis karena berpotensi mendatangkan lebih banyak wisatawan, baik dari dalam maupun luar kota, bahkan luar negeri. Great blog post. Brings me right back to HK and peaceful days in the Chi Lin Nunnery! Hi John. Thanks! Chi Lin Nunnery is also one of my favorite places in the city. If I were to live in HK I would make Chi Lin Nunnery and Nan Lian Garden as my usual spots to find peace and tranquility. Hi Emiel. Thank you! It took forever to get that shot of the moon gate as I had to wait until it was clear of people and I also had to adjust my camera position several times. So yes, patience is the key. 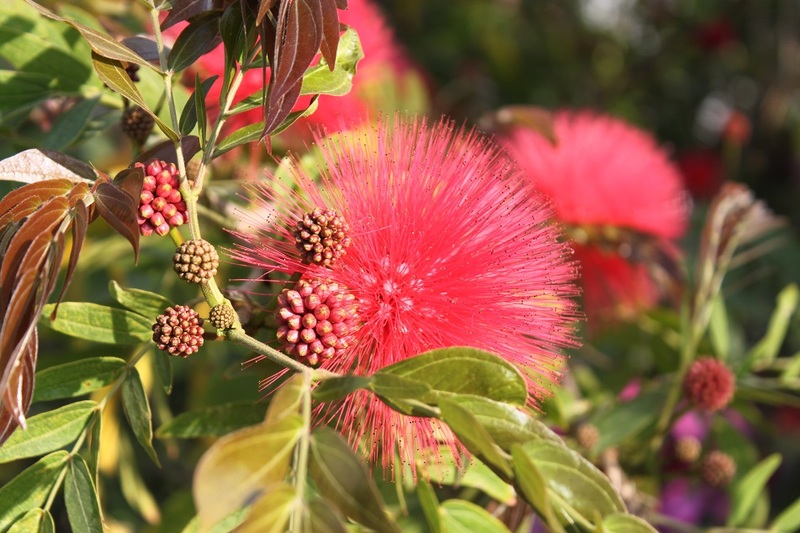 Slowing down really helps us marveling at the intricate details of places we visit, indeed. Your shots are gorgeous, Bama – I never did get a good one of the intricate woodcarvings! It takes a steady hand for those close-ups, especially when they’re in the shade. Thanks for coming to Hong Kong back in February… it gave me a great excuse to visit places like Ping Shan and Sai Kung. I’m so glad the weather was perfect that week! Makasih banyak, James! 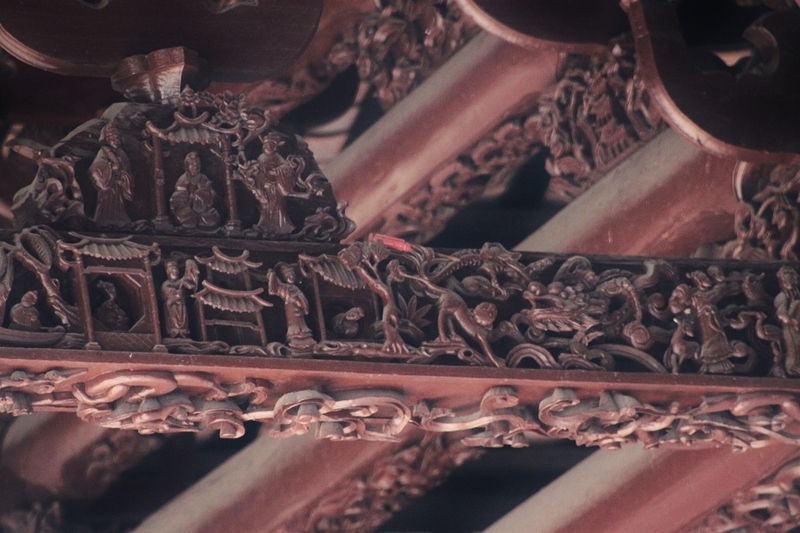 I took hundreds of photos from Ping Shan alone, and some of the photos of the intricate woodcarvings turned out quite blurry. Thanks for researching on Ping Shan at the first place, and I’m glad it was the first visit to that side of HK for both of us. Ada keasyikan tersendiri saat kita bisa bertualang di kota orang sampai ke daerah pelosoknya yang tidak diketahui wisatawan. Betul! Itu salah satu keuntungan punya teman lokal yang tahu tempat-tempat yang kebanyakan wisatawan tidak tahu. As for the time I spent on each object, it really depends on the object. Sometimes I spent a few seconds, but some other times I spent minutes just taking photos of one object, especially the most intricate ones. Merci! Have a nice week too! Beautiful photos, this post has made me want to visit!! Hong Kong is more than just a concrete jungle. 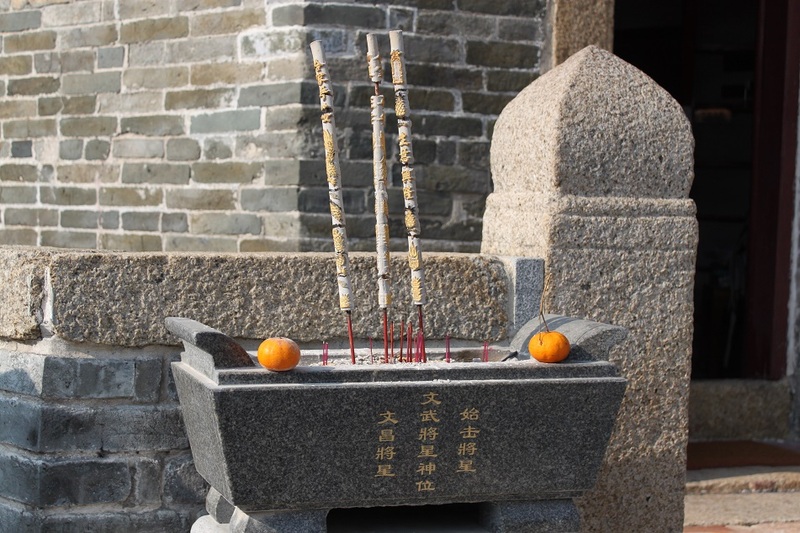 It has great hiking trails, white sand beaches, and historical places like the one in Ping Shan. Thanks for your kind words! Glad you enjoyed the photos. 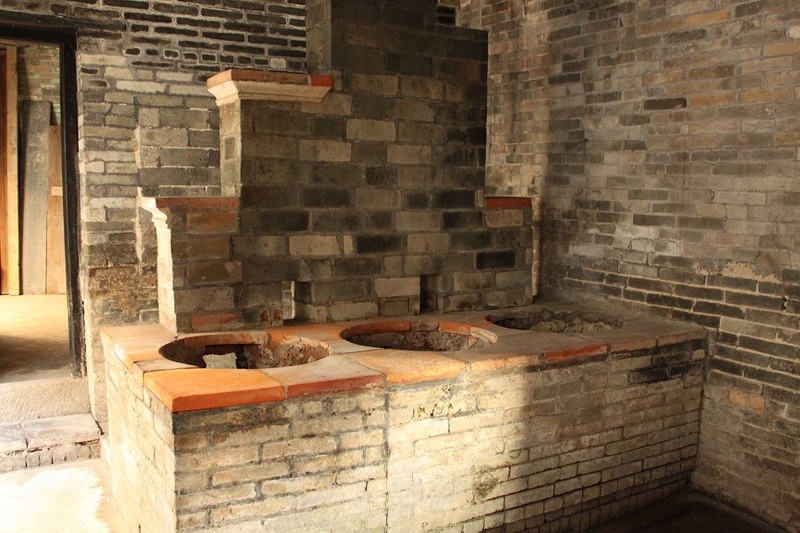 Ping Shan Heritage Trail surely worth a visit if you like history. It also provides a nice escape from the hustle and bustle of downtown HK. I’m really fortunate with the weather and the fact that James is a local. If I wandered around HK all by myself I might have completely missed this place. That is so true! It’s no coincidence that the more we travel, the more places we add to our wishlist. We look for the same thing when we travel, and sometimes we take too similar photos exactly because of that. 🙂 Asia has been the focus of our trips, and with him speaking Mandarin/Cantonese and I Indonesian/Malay we managed to delve quite deeply into the culture of each place we visited. Always… amazing pictures and well written… Envy to both of you 🙂 visiting all the less crowded places in Hong Kong but gorgeous! Thank you very much, you’re really kind. 🙂 Most Indonesians only know HK as a shopping destination, hence it’s often overlooked by history buffs. But beyond the endless skyscrapers there are the great outdoors and interesting historical sites. As for the new header, thank you! Glad you like it. This is a fantastic sight! I have been to Hong Kong a few times and have never heard of it. It is very beautiful! I am going to Hong Kong in December and will make sure to put Ping Shan on my itinerary!! Hi Catherine & Fabian. Hopefully the weather will be nice when you come back to HK this December. I found Ping Shan very calm and peaceful, truly a nice respite from the cacophony of downtown HK. an amazing walk of a part of the world that still mystifies, even today. I was drawn to this piece because of the pictures, we just dont have such unique architechture in South Africa, let alone building that have weathered centuries. Loved it. I absolutely love it! I have been to Hong Kong and I actually stayed in Kowloon but I didn’t have the time to explore it. I was too busy doing the tourist stuff, and going to all the markets with fascination LOL!. This’ll be great for next time though! Great story Bama! You took us to a magical place with your writing and beautiful photos.. Awesome journey. Love the images! Hi Jules. Wow, you really lived in the far side of HK. Did you enjoy it? Was it truly a peaceful retreat from HK’s busy city life? Thanks for dropping by, and I’m glad this post brings back some fond memories of yours. Let’s just say it was different! Hard work for a non-Cantonese speaker, and so unlike much of contemporary Hong Kong. But I’ll never forget it, that’s for sure. Mandarin was hard enough for me to learn, let alone Cantonese with its richer vocabulary and tones. However I often find places where the locals don’t really speak any languages I know very intriguing. The wood carvings are spectacular! They really are, and I was instantly captivated by them once I passed through the gate. I like your descriptions too. You really bring us to the places and make us feel relaxed, as if we too are really there. Describing a setting sun is great for this! Thank you! I’m glad this post did that to you as the trip did the same to me, making me feel relaxed that is. Most people have no idea this place does exist in Hong Kong, even the locals. If you like history and walking down heritage trails, you really should consider visiting Ping Shan the next time you come to Hong Kong. And the photos are beautiful, by the way, really.. Thank you so much, Daydee! If Hong Kong advertised this more in their huge, beautiful airport, I’d be all over this trail. I’ve been in Hong Kong thrice now, and HAD NO IDEA THIS EXISTED. I feel like I seriously missed out on something fascinating. Such lovely heritage. And nice photography too! Hi Param. Than you for your kind words. To find such place in Hong Kong was such a nice surprise, indeed. Pingback: A Tale of Three Cities: Hong Kong | What an Amazing World!